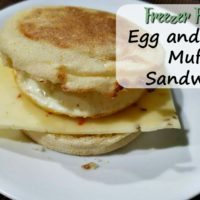 After living on a small budget for awhile, I started to realize how cheap breakfast was. 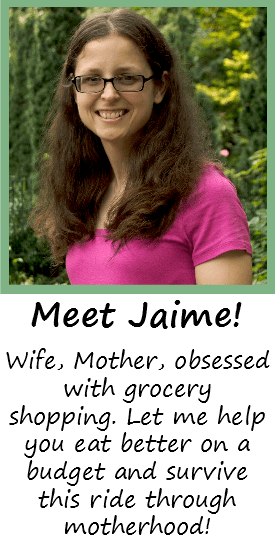 Making something for dinner that was inexpensive and that tastes delicious was definitely something I wanted to add to my menu every week! My usual go-to breakfast-for-dinner item is pancakes because they’re simple to make and I always have the ingredients. But recently I wanted something different; I looked in the freezer and saw three frozen sausage patties that needed to be used up, and then it hit me: Calzones. Calzones in themselves are really easy to make. It’s just smaller pieces of pizza dough that you stuff with food and fold over. I suppose you could even call it a Hot Pocket, but seriously, these Sausage Egg and Cheese Breakfast Calzones are much bigger and better. For this recipe, I used my own Bread Machine Pizza Dough because I had all the ingredients. You could also buy a can of pizza dough for this; I’ve never done it, so you may need to scale down the recipe and make 4 instead of 6 or something. I’m not sure how big the canned pizza dough is. But if you use my recipe, just take out the dough once it finishes in the bread machine and cut it into 6 equal pieces. If you ever struggle with getting food to be equal sizes, I highly suggest getting a food scale. Nothing fancy; just big enough to weigh out bits of food. What I do is put a plate on the scale and turn it on; then put the entire ball of dough on the plate and write down the weight. I then divide that by 6, and that number will be how big each piece of dough needs to be. I like things to be equal, and a cheap food scale does the trick quite nicely! 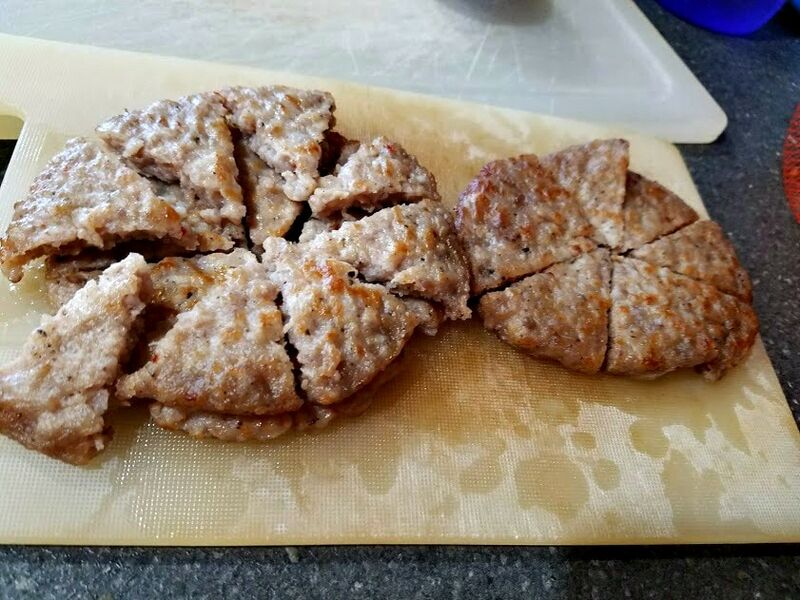 I used frozen sausage patties for this recipe, but you can use whatever you have at home: Ground sausage, bacon strips, ham… or no meat at all. I got lucky in that I had all the ingredients already, so this was practically a free dinner- keeping a well-stocked pantry helps! The next time you’re looking for something different for dinner, give these Sausage Egg and Cheese Breakfast Calzones a try. 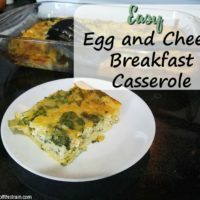 The leftovers make a delicious breakfast the next morning! 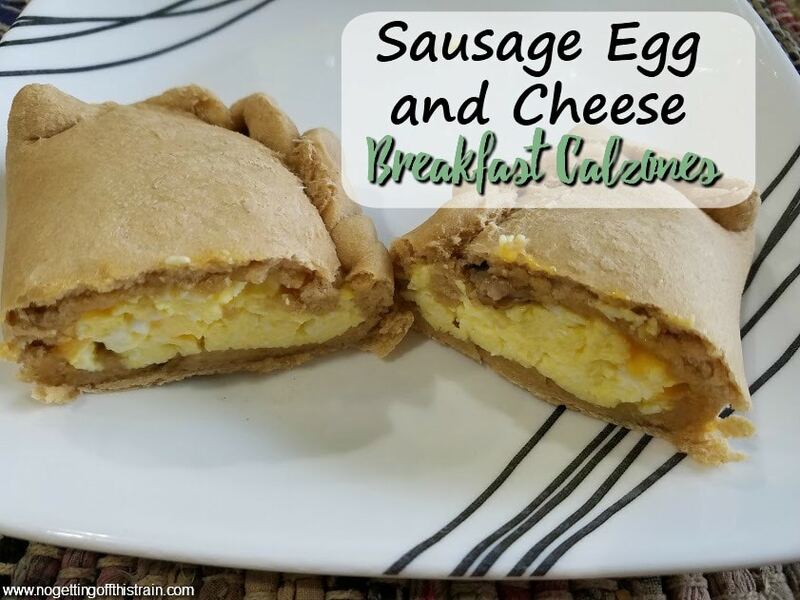 These Breakfast Calzones are loaded with sausage, egg, and cheese; are easy to prepare; and are delicious for breakfast OR dinner! Roll out the 6 pieces of dough if needed. 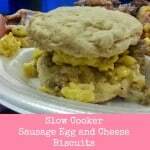 On half of each piece, evenly add the sausage, egg, and 1/4 cup of shredded cheese. Fold over the top piece, and carefully pinch the edges closed. I tend to leave a little room on the bottom edge to pinch over the top to make sure it's properly sealed. 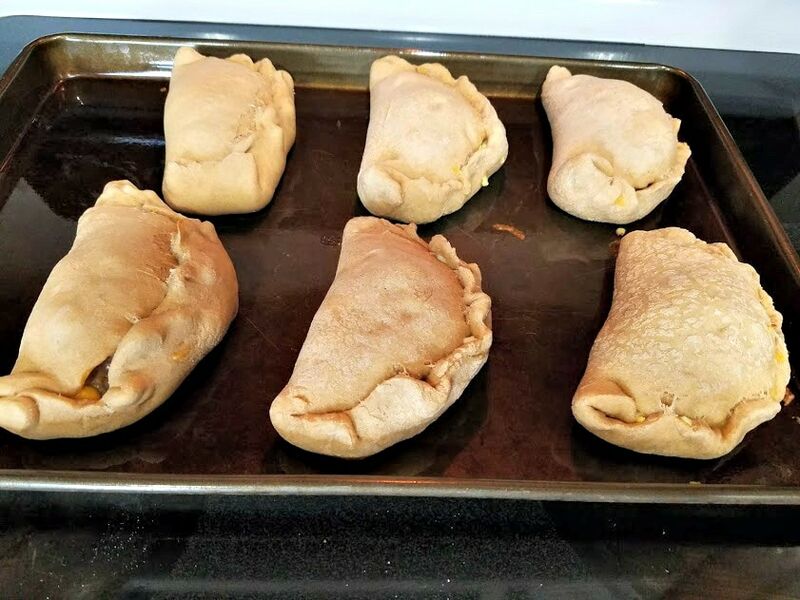 Place each calzone on the cookie sheet and bake for 10-12 minutes until the tops of the calzones are slightly browned and hard to the touch. I make homemade pizza every Friday but for some reason never thought of breakfast calzones 😋 sounds yummy! They’re super good! =) And I need to get into the habit of weekly pizza night because it can be such a cheap meal!